“I am so happy and grateful to have had Coach Colin’s coaching expertise for the last year. I started working with Coach Colin on December 15, 2016. By April I met my first goal- qualifying for Kona at Ironman Texas. In July I met another goal of qualifying for 70.3 World C hampionship Chattanooga at Muncie 70.3. Coach Colin was always available to me. He provided me with training based on my current data from all disciplines, constantly updating workouts. My workouts covered everything needed for successful triathloning including swim, bike, run techniques/strategies nutrition, strength, yoga, pilates, equipment, technology and more. Whatever I needed- he was there for me. At the World Ironman Championships in Kona, I earned a third place age group podium finish. A 19 year dream for me had come true- on the podium in Hawaii after 5 attempts. I was more than 1 HOUR faster from the previous year –Thanks to Coach Colin. It was so much easier because of working with Coach Colin!!!! Coach then had a great recovery plan for me and I raced in Cozumel in November. I qualified for Kona for next year. After working with Coach Colin my results were more than I dreamed possible- 5-age group firsts, a third and an eleventh place age group finishes for the season. I hope everyone understands I’m not bragging about myself– I want to brag about the great coaching of Colin Cook.” -Joanne F.
“Having decided at age 48 to enter the world of triathlon encouraged by my (then) 17 year old son, I competed for the following 3 years at Sprint, International and Olympic distance along with several duathlons along the way. I did Pumpkinman Half Iron in 2011 & 2012 with some success and had signed up for my second marathon, 32 years after my last one! I decided early on that an Ironman was in my future, perhaps 5 years out – rekindling a dream started in college. That time was arriving. 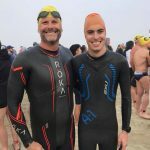 After a miserable swim at Sprint Nationals – despite being self driven, I knew I needed swim help AND if I were to do an Ironman – I needed a coach. I was fortunate to find Colin Cook and Peak Triathlon Coaching. Colin has always impressed me with his history, honesty, family values and the way he unwaveringly walks the talk. He fine tunes his (my) plan for a 50 something year old man vs. a 24 year old woman (for example). He takes into consideration lifestyle, competitive history, nutrition (past, current and improvement areas), weaknesses and strengths. There isn’t a one size fits all in great coaching. There have been times when I just did not feel up to a certain workout, but with Colin in my ear (along with the example he lives each day) – off I’d go, most likely surprising myself with a great effort. Sitting here today, I have completed nine Half Ironman and five Full Ironman events including my fastest ever at both distances in the past year – at age 55. Culminating in qualifying for and racing in the Ironman World Championship in KONA! This simply would not have happened without Colin’s coaching, education, guidance, strategy and support – for which I will be eternally grateful.” – Jim P.
“I hired Colin to help me with my first 70.3 in Miami. I chose him because of his experience but also because he is a husband and father. I am a wife and mother of two young children, and I knew that he would understand the challenges that go along with training, parenting and career life. He knows what it takes to balance it all. I could not have done this without his knowledge and expertise. I was well prepared and felt strong throughout the race. His advice on proper nutrition during the race was critical. Crossing the finish line was one of the greatest moments in my life! Thank you Colin for being a part of this incredible journey. I look forward to working with you in the future! 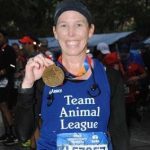 -Kelly L.
“As a long time single sport athlete (running marathons in all 50 states with NO cross training), I was quite nervous about taking on the challenge of a triathlon but after signing up for an Ironman, buying a tri-bike and interviewing several coaches (in that order), I chose Colin as the right coach for me. I could not have been more pleased with my decision. During the first few weeks of working with Colin, I came to realize that it was not all about endurance – that while I had to ‘master’ swimming and biking, it was not all about getting onto the bike (in my basement in November in Maine) and riding for hours, or into the pool and going back & forth for forever – but about using a variety of speeds, drills and cadences to really drive my fitness and ability to succeed. I had some spills along the way that tested my confidence (I rode clipped in outside for the first time in March for a September IM), but Colin was able to get me back up on the bike and mixed encouragement and a pushed in just the right way. I even learned to embrace my aerobars – something I thought I would never, ever do. After a freak accident in Chattanooga (2 kids, a cat, an ambulance, the ER and ultimately a clean bill of health), he was there to get me on track for the full distance Beach to Battleship a month later (despite being in Kona competing himself). Sometimes people say, “I could not have done it without you” I really, really mean it when I say that there is no way I would have completed a full IM distance triathlon a year to the day after I was fitted for my bike without Colin’s guidance, encouragement and a few well-timed pushes.” – Lydia J. “I’ve competed and trained with Colin for a number of years, so when I qualified for Leadville I knew Colin had just the expertise I needed to help me reach the level of conditioning required for such a grueling race- and man was I right! With Colin’s help I was able finish the Race Across the Sky well under my time goal, bringing home the much coveted big buckle; I couldn’t have done it without him! I’ve never been much of a metrics guy and I always thought I could get by training in my own haphazard way, but I can honestly say Colin and the Peak Triathlon Coaching team have shown me the light! Thanks to their careful planning, friendly encouragement and deep pool of experience I have been able to meet and exceed goals which seemed a long way off only a short year ago. I am very impressed with where the Peak team has taken me and so many of my fellow athletes; from Leadville, to Triathlon Worlds, to Kona- and everything in between- Peak and Colin know how to get it done. Many thanks for helping in the journey thus far! I can’t wait to see what’s next!” – Greg I. “I started working with Colin in order to prepare for my first ever 70.3. I had participated in a few shorter distance triathlons, but had done them all just to have fun and finish. Colin helped me take both my overall fitness and my triathlon performance to a new level. He really listens to what your goals are and helps work around your schedule to tailor a training plan that fits your life and pushes you to do more than you thought possible. Not only did I finish the 70.3 much faster than I was expecting, I was able to race smart thanks to Colin’s coaching, which really helped me think about each element of the race and how it would affect the next. Following the 70.3, I continued to train with Colin for the NYC marathon (my 8th marathon, but first time running NYC) in which I wanted to PR. Thanks to Colin’s coaching, I was able to shave 5 minutes off my marathon PR (on a course inhospitable to PRs). While I was extremely happy with my performance in the two races I trained for with Colin, what I value most about having him as my coach, is that he showed me that if I set a goal for myself, and push hard during training, I can achieve those goals and more. He inspired me, both with his coaching and with his own amazing racing prowess, to achieve a level of fitness that I never thought possible. That said, Colin also knows when to let you rest, both for your body and your mind. He is always checking in and fine-tuning your training as things change, and for that I was very grateful. I travel a lot, and he was a genius at adapting my training to the various countries I ran in and hotel gyms that I was forced to use along the way. I am currently taking some time off of training, but I am very much looking forward to the time when I will once again wake up each morning to an email from Colin outlining that day’s work out.” – Anri B. “Working with Colin was a pure pleasure. We got together before I started my plan to make sure I was building the proper base to be ready, put together a solid training plan that had me well prepared to meet my goals, and he helped me with a race strategy (including pacing and nutrition) that I was able to execute on race day. His knowledge and experience in the sport of triathlon was invaluable in helping me prepare for my first iron distance race. Colin was always available to answer any and all questions I had. His experience in preparing for and racing triathlon was invaluable. Colin’s knowledge of training, nutrition, and race execution is unparalleled. It is no surprise that he makes a yearly trip to Kona!” – Dan G.
“Before I met Colin, I was a “find a training plan online and do it” kind of girl. But, when I decided to tackle my first 26.2 I knew that I would need extra help. Working with Colin is awesome because you get so much more than just numbers on the page. He helps out with the tough questions like running form, nutrition, hydration, motivation, and everything else in between. He is fun and friendly, yet always professional. He definitely works you hard, but it pays off … believe me! After working with him for about six months, I decimated my half marathon PR by ten minutes and even came in third in my age group (a first for me in a race that big!). And yes, I rocked my marathon too!” – Jessica C.
“I have always liked swimming and biking, so at the age of 54 I decided to sign up for a sprint triathlon. A lot of people told me the swimming was difficult because there are so many people, so I took the Nashua YMCA triathlon swim class. That is where I met Colin. I felt his coaching there was invaluable and I enjoyed the class. My first triathlon was at the age of 55. Even though I had never run I trained by myself until I could run 3 miles. It was very difficult. I enjoyed my first sprint triathlon so I signed up for 2 more that summer, On the last one I placed 3rd in my age group. The next summer I signed up for 4 more. After the 2nd I hired Colin to coach me to improve my personal records. I came in 2nd. Unfortunately, I had a bike accident and couldn’t compete in the 4th. The next year I signed up for 2 sprints and felt I wanted to challenge myself more so signed up for an Olympic triathlon. I tried training by myself, but six weeks before this triathlon I still hadn’t run farther than 5 miles so I hired Colin again and he put me to work. He taught me how to do interval training which I had never done. It wasn’t easy with my very hectic schedule of working 6 days a week. Two weeks before the race I was able to run just over 7 miles. This was a much easier than going it alone. Whew! I competed in the Olympic Triathlon and achieved my personal bests in all categories – even running. If it wasn’t for Colin I would have had much difficulty with the Olympic triathlon and achieving my personal bests. I am planning to do more Olympic triathlons this year and I will definitely be using Colin for coaching again. I feel having support and coaching is essential in achieving goals regardless of age or competitor level and I would highly recommend Colin to anyone.” – Donna G.
“I have been working with Colin for almost two years. 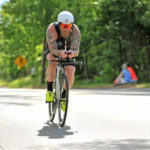 I started racing triathlon after seeing my father in-law compete in a sprint distance race and thought that it looked fun and wanted to give it a try. At that point I started reading up on triathlon and training myself, and by doing this I was able to race and I survived my Ironman 70.3. After doing this I joined NorthEast MultiSport and met Colin in late 2011. He took me on as a client and from there everything started drastically improving. In just two short years I went from barely finishing to PR’ing by almost a full hour at the 70.3 distance and more recently completing my first full Ironman up at Lake Placid in 2013. Not only did I finish IMLP but I achieved my goal of a sub twelve hour Ironman on my first try. For this I would like to thank Colin, because it is only with his training plan, guidance and encouragement that I was able to achieve my goal. Colin’s training plans during the last couple years were spot on for me. There were times when it needed to be modified depending on how I was feeling, and he was right there to listen, and help me modify that workout. He is always very encouraging, never judgemental, however, he isn’t afraid to tell you when you need to just get it done! Colin also leads by example and is a great athlete. As an aspiring racer it gives me something to push and work for. I am really looking forward to the many great years of racing ahead of me and I always hope to have Colin Cook in my corner.” – Chris V.
“I started working with Colin a year and a half ago. In that time, he has helped me drop my Ironman PR by two hours, qualify for Ironman World Championships, Ironman 70.3 World Championships, and the Boston Marathon. Colin clearly understands how to train athletes to their potential. However, what makes Colin different is the passion that puts into training his athletes. Colin goes out of his way to send that motivational email or text when things are going well. He will meet you for extra technique sessions or let you borrow equipment when you have to travel for a race. Overall, Colin goes the extra mile for his athletes and I personally attribute much of my success to working with him.” – Steve V.
“Leslie was able to personalize a plan that transformed my life. My kids love the new recipes.” – Roger C.
“I have been a member of Peak Triathlon Coaching for 3 years now and have been having great success with many PR’s in all triathlon distances. Recently I have been struggling with nutrition in the IM 70.3 and IM 140.6 distances. Although I was getting stronger and faster in the three sports I was being held back by gastro intestinal and reflux problems every time I would get to the run. Colin Cook being my coach suggested that I talk to Leslie Why and work with her before my last race of the season, Beach to Battleship Half Iron Distance. I started working with Leslie at the beginning of September and after testing she put together a race nutrition plan. She also suggested that I take a look at my everyday nutrition, and boy was she right! Between my race nutrition plan and changing my everyday nutrition I leaned out and started to feel totally different during and after workouts. I had more energy and didn’t feel completely crappy/ dehydrated afterwards, which would greatly affect my recovery before my next workout. I was excited to race B2B and had a great day. I PR’d by 20 minutes and went from a 5:06 to a 4:45 in a matter of 2 months. My gut felt great during the race and I didn’t have any stomach/ reflux problems. Leslie was spot on with what I needed to do in order to achieve my own goal. I also believe her approach to everyday nutrition is important and would benefit anyone, not just multisport athletes. She is really easy to work with and makes nutrition fun, which seems impossible!” – Chris V.
“Colin and Leslie of Peak Triathlon Coaching are fantastic coaches that really understand how to create a training plan customized to your needs. In 2012, I started running a couch to 5k program in April and did a sprint at the end of August. I realized I needed a real coach and signed on with Colin. He helped me get ready for my first half Ironman 70.3 at Pumpkinman and I had everything dialed in for a great race. I used Colin’s suggestions in the off season to improve my swim, run and bike form to help me finish a full 140.6 Ironman the next season. I was right at my target time and super happy with the results. I nailed the execution of both my training plan by Colin and nutrition plan by Leslie. I can honestly say I couldn’t have done an Ironman without Peak Triathlon Coaching.” – Ryan I. “As promised, Leslie delivered. She provided me exceptional guidance throughout Ironman training and for the race. 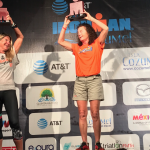 With Leslie‘s coaching, I maintained high energy levels during the months of training prior to the race and then completed my Ironman ahead of goal with excellent energy, no cramps, and no stomach issues. Not only does she know her stuff, she’s cool.” – Matt T.
“Before I hired Trent, I had a solid background in running with a few short course triathlons under my belt. I had strongly hesitated about hiring a coach because I was “only an age grouper” and triathlon was “only a hobby”. I finally decided to hire a coach when I committed to my first half Ironman (70.3), knowing that my ultimate goal was to complete a full Ironman (140.6). It was the best decision I could have made. The PTC philosophy fit me well. Trent provided the structure and guidance that I needed to surpass my goals and become more aware as an athlete. He taught me how to adopt triathlon as a lifestyle, trust my body, and keep life balance in mind. His lighthearted approach helped me get out of my head and enjoy my journey. I could worry less about planning and enjoy doing the work to prepare for my races. We had regular check-ins to discuss progress and concerns, which really helped me develop better habits. He even worked through my recovery from an episode of vertigo (BPPV). With Trent’s coaching I had 2 of my best race seasons yet. Most importantly I completed higher volume (and better quality) training than ever before while staying healthy and not burning out. There is no question in my mind that Trent’s coaching made me a stronger athlete and changed the way I will approach my training for the rest of my life. The lessons are invaluable, but the proof is in the pudding: PRs in every single distance that I raced and my first ever Ironman finish” – Lori V.
“I started with Peak Triathlon Coaching / Coach Trent in the winter of 2014. I was given monthly workout blocks with detailed workouts for all three disciplines. Coach Trent is very knowledgeable, very easy to talk to and was able to answer my many questions. I raced several times that season doing well in all of them. A full 140.6 was my goal race and I wanted to do as well as someone without any experience could do. Coach Trent got me much stronger, more knowledgeable in the sport and with him and Coach Colin backing me up, I was able to complete my first Ironman. I finished the race in a good overall time and had a congratulation text awaiting for me from Coach Trent back at home. Coach Trent has helped me build confidence in the three disciplines and made me stronger for it. It was a pleasure working with him.” – James B. “My first experience with Peak Tri Coaching was when I started swim class with Colin at the Nashua Y in September of 2013. My first Sprint Tri was 1 week prior to my first session with Colin. At that first Tri, I was sure I was going to drown. I didn’t want to feel that way again so I signed up for Colin’s swim classes. I could swim, but I was not a confident swimmer and I wanted to build confidence. Well, apparently I built enough confidence in my swimming because in December I signed up for Timberman 70.3 2014. I knew I wanted to work with Peak Tri Training since this was all new to me and I needed a solid plan to follow. Colin set me up with Trent and he started me on an official plan in March 2014. I signed up for just the ‘plan’ option from March through May, then I transitioned to the ‘Full Coaching’ option from June until race day in August. Each day, each week, each month, the plan helped me build the endurance required for Timberman. Transitioning to the Full Training was very helpful as well. Each Wednesday, Trent and I would discuss the previous weeks results and the upcoming weeks plan (and purpose). We would talk about everything from pedal/cleat/shoe fit to nutrition. I found the entire process to be such a great learning experience. In preparation for Timberman, Trent suggested the Nashua sprint as well as the Mass State Olympic length. Trent adjusted my plan to accommodate both of those races. I felt better after the Olympic length than I did after the Sprint – a testament to the results gained from the training plan. I was building the endurance I would need for Timberman. The big day arrived…I was nervous but trusted my training. My goal was to get to the starting line, finish the whole race and feel decent at the end…mission accomplished! Along with the weekly plan, Trent provided Race Day plans as well – which really kept me focused on race day. I could not have accomplished this without Peak Tri Training. Thank you Trent and Colin!! !” – Michelle M.
“Colin and Trent are amazing coaches. Knowledgeable, caring, and dependable are the first words that come to mind for the Peak Triathlon Coaches. They helped me stay focused, consistent, and injury-free. Most importantly, I was able to complete my goal of becoming an Ironman under their guidance. Despite being World Champions themselves, I did not ever feel like my goal was less worthy. Not only do they guide you with your athletic goals, but they assure you are staying healthy, rested, and having fun so you can stay in this sport as long as possible. I can not recommend them enough. They are the real deal.” – Karin C.
“We really enjoyed working with Trent. He is personable and knowledgeable, and we exercised a whole lot more than we would have without his guidance. He came over and helped us set up the electronic gadgets, and then again to troubleshoot when something wasn’t working quite right. We had great results from the training and I even won my age group in the sprint triathlon! We are hoping to train again this year with Trent. He has even gotten us thinking about Olympic distance, which I hadn’t considered before.” – Kathryn F.
“I have had such a positive experience with Trent and Peak I hope you will accept the attached testimonial. It was truly an honor to wear the Peak colors this year and I only hope I can continue to improve and wear your colors again next year…..hopefully I will get faster next year so people will see the colors but they will be blurry. Thank you to you, Trent, Leslie and your entire staff as well as your other athletes who have gone out of their way to help me.” – Mark B. “I recently worked with Karin while training for my third marathon. Previously, I had started two other marathons but due to injuries that lead to lack of training, I had not finished them. 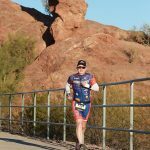 Karin understood my problem – as I started to pile the miles on during training, I would start to suffer from knee pain that hindered my training. Because of this, she put together a plan that start with core training to strengthen my body and then included cross training to continue building my endurance without putting the pressure on my knees. Not only did she create workouts for me, but she talked me off the ledge when I was ready to quit, helped me with meal prep to make sure that my body hd the fuel it needed and was an mazing cheerleader along the way. If it wasn’t for Karin I am not sure that I would have successfully completed the marathon and be so excited to run another. I would recommend Karin again, again and again. 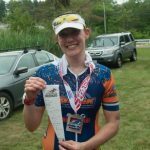 She is amazing coach and athlete herself making her truly inspiring and a joy to work with.” -Hill C.
“I started doing triathlons in 2013 when I completed my first sprint tri. The following year I signed up with a coach and worked up to what I thought was a long distance with an Olympic tri. I progressed to a 70.3 in 2015 and my coach at the time moved on to nutrition coaching in the middle of that season. I was introduced to Elliot a month or two prior to doing my second 70.3 that year and I have been with him ever since. Elliot has seen me through race prep, with various injuries and still managed to get me to race day so that I could perform the best I could. He helped me complete my first Ironman in 2016 and worked with me to improve my weaknesses to enable me to move up from the middle of the pack. In 2017, I was involved in a horrible bike crash that put a halt to my training for 6 weeks. I had a C1 fracture and was in a neck brace. Elliot worked with me on a training plan to get me back in shape for a 70.3 three months after the crash and a full Ironman 3 months after that. I PR’d the run for the 70.3 distance and PR’d the swim, bike and total time for the full Ironman. Not only were the workouts tailored to my needs at any given time, the prepping for individual races has helped me race my best. I can’t recommend Elliot enough regardless of what stage you are in your triathlon experience.” -Brian M.
“I am a 40 – 44 male age group athlete. I have been racing triathlon for the past three years. After several interviews and much research about coaching and coaches, I am just completing my second year with Peak Tri Coaching, and more specifically Elliot Kawaoka. I can’t say enough good things about the results I’ve been able to achieve and the relationship we’ve developed over the past 2 seasons. Elliot’s coaching has led to PR’s in every race at every distance in every discipline with absolute consistency. To be clear, I don’t mean that I have PR’d each distance in each year, I mean every single race regardless of the distance results in a personal best. This includes 2 podium’s in my last three races. We have reached levels of performance that I didn’t think I was capable of. Elliot has always made himself available by phone, text or email regardless of how big or small the question. We evaluate every race and season for the next set of goals to which he develops and recommends a plan that ensures success. Most important is that he listens to what I have to say and does an amazing job of adjusting around my personal needs. I give Elliot a lot of credit as he has brought me from age group finisher to competitor. “Last year I committed to changing my physical and mental programming long term. Objectively, I had the best 12-month start I could. One year is merely a beginning. But, I couldn’t have done it without Elliot. I think of that often. I know he really can’t appreciate coming off an injury for five years, gaining weight, deteriorating, etc. (hope he never does). But, Elliot’s influence mitigated all the variables involved over the year. That’s pretty powerful. Most people don’t even realize how others impact them. Those that due rarely express appreciation. Elliot impacts a lot of people. I greatly appreciate everything and look forward to the future. Last year at this time, I seriously questioned – even with a year of training, whether I could complete 140.6. My world and those around me is significantly enhanced. That’s a pretty huge impact, man!! !” -Jeffrey G.
“Before I started training with Elliot, I found myself getting overwhelmed creating my own training plan and was constantly injured. I was nervous having a male coach me, but 1.5 years later, I would not have anyone else! Having him as a coach has allowed me more time to focus on training and am less stressed. Even when life happens, he adjusts my running schedule to match with my life schedule. I am also proud to say that I have been injury-free since I started training with him. My workouts are never the same and the workouts challenging but manageable. Not only has Elliot been a great coach, but he’s been one of my biggest supporters and motivators. He is always there when I need the extra boost. I would highly recommend Elliot as a coach!” -Haylee F.
“Elliot is a great coach. I met him via Facebook and he’s been a great inspiration to me in the sport of triathlon, especially the full Ironman distance. Last summer, I reached out to him and he’s been coaching me ever since. It’s been a great racing year despite a crazy life and demanding work schedule. I have learned a lot, trained a lot more consistent, and PRed at my races, it’s been a fun journey! The customization of training plan, phone calls before races on race strategy, and the motivation are the best! I’d highly recommend Elliot as a coach.” -Bruce L.
“Chris is exactly what I needed. He’s thoughtful, reliable and patient. What I find to be most helpful in him, is that he’s very knowledgeable about what it means to train at various levels and he’s considerate of goals and setbacks. It’s not as though working with Chris automatically exempts me from having days where I don’t feel like getting out of bed and working out, but knowing that he’s going to log on to check my activity in Training Peaks or text me to see what limitations I have with my schedule any given week so that he can make my workouts manageable – is now what gets me to get-up-and-go. He’s working to help me achieve my goal, so I should be working even harder. When I have a day or week where I can’t get-up-and-go, Chris is there, not to judge, but to push. He’ll tell me it’s time to sign up for a half marathon because that’s what will motivate me; that I need a goal to work towards because when I achieve that goal, I’ll reach a new level of physical capability; he’ll offer to meet me for a run somewhere even on a cold December morning; he’ll tell me to do something-like walking the dog-even if it’s not running. I have no question about Chris’ technical knowledge when it comes to safely training anyone. He had me fill out a comprehensive questionnaire before we started working together. The questionnaire asked about diet, history, career-things I never really considered would have an impact on how I worked out or felt about working out. He knew exactly what equipment I should get so he could monitor my activity level and build my workouts off of that information. I would recommend anyone to work with Chris for the reasons above-but also because he, himself is motivation for anyone to get up and do something at 5AM. Watching him train and compete-there’s no one I know with more discipline, drive and passion for helping people meet their physical goals.” -Alissa V.
“I have had the distinct pleasure of having Chris as a coach for the past six months. I am new to the sport of triathlon racing, and Chris guided me through every step of the way. His hands on approach to making sure that my form was good in each event was incredibly helpful, not to mention illuminating. Each week I received a training plan in my email, which was clear, pushed me and scaffolded week to week in a logical and productive fashion. Chris answered numerous questions and was an invaluable resource as I approached my first triathlon. On the morning of my first race (sprint) I experienced incredible calm knowing that I had followed his plan, I had done the work and the only thing left was to enjoy the race. I feel so grateful to Chris for giving me such a remarkable introduction to this amazing sport, and the guidance to make sure I was prepared and ultimately successful! He is a pleasure to work with.” -Tim C.
“I have worked with Chris Veilleux as a tri coach for the 2015-2016 season and have been thrilled with the results that I have achieved. With Chris’s guidance, on a year over year basis, I improved my HIM time by 27 minutes for the same race and saw improvement within every discipline. Additionally, I was able to qualify for the Olympic distance national championships in Omaha, Nebraska. Chris understands the work and life challenges and has the ability to manage complex schedules and conflicts to achieve strong results. Chris is also a great teacher and as a result brings the teachings of the sport into the training program. With Coach Chris, I have learned a great deal and the accomplishments this season would not have been possible without his leadership, training program and mentorship.” -Jim C.
“I worked with Chris during the 2016 season after injuries stalled my 2015 race season. Starting in the winter, Chris helped me regain my run form after a knee injury sidelined me for the previous 6 months. I finished a half marathon in March in about the same time as I did the prior year before my injury, despite having only a couple months to train. I was on track for a June 70.3 before tearing 2 ligaments in my hip. I had to skip that race and my first full IM in two years scheduled for September looked like it might be in question. Chris being the optimist, kept me swimming and biking (lightly) while I took some doctor mandated time off from running and adjusted my plan to keep me on track. Despite missing two months of prime run building time, Chris kept my confidence up that I would be able to compete in Chattanooga. During the VERY slow process of building my run volume (and bike speed) back up I started to question whether or not I had the time to prep, but Chris kept me moving forward and my eye on the prize. I was only able to hit 11 miles as my longest run before race day and the 112 mile mark on the bike twice, and while I thought I was going to be in for a very long day, Chris kept faith that I’d be able to hit a pretty aggressive target. Without his positive reinforcement and adapting to my injury/schedule, I would’ve pulled out of the race. Since I had also had to skip a race in 2015 due to injury, another DNS had me starting to think I should give up hopes of my 3rd IM altogether. When race day came I went out with a solid race plan and the attitude of giving it everything I had and whatever happened, happened, but always had Chris in the back of my mind telling me I’d be able to do more than I thought I could. Despite some record heat in TN (95+ degrees), I was able to beat my expected time by over an hour and my first IM time by more than 20 minutes. I ran the full marathon without any pain and never had to walk (aside from aid stations and a little on one giant hill! ), which is more than I ever hoped for. While not exactly a PR, I was incredibly happy and surprised (though Chris wasn’t surprised) with my time. Without Chris’s coaching and positive attitude I never would’ve had such a great race and may never even made it to the starting line at all. Thanks coach!” -Chad Q. “Anything can happen during the time it takes to train for an Ironman – career change, family crisis, stress fracture, never mind the day-to-day challenges of a working Mom. This all happened to me and more! Coach Dan guided me through every road block and kept me on plan to meet my goal at Ironman Lake Placid! Thanks Dan and Peak Triathlon Coaching!” -Siobhan C.
“Choosing Peak Triathlon Coaching and Coach Dan has been one of the best decisions I’ve made since I started running 10 years ago. Dan’s energy and enthusiasm are contagious, and pushed me train harderthan I ever thought possible! Thanks to Dan’s customized and detailed training plan, I am not only fitter and faster, but have the knowledge and tools I need to achieve—and even exceed—my race day goals.” -Mary E.
“Erik got Duane and I to the Ironman Mont Tremblant starting line healthy, injury free, and ready to accomplish our dreams! Erik not only has the knowledge and first hand experience, he knows his athletes and has a calm way ofeducating and coaching you to succeed and push away any self doubt. I was so surprised at how great I felt during the training for the IronMan. I was well rested and always looking forward to the next training session. Erik continued to coach me through my 2nd Half Ironman. I finished feeling strong and with a 15 min PR! Erik is an amazing coach who and has a special way of making you believe in yourself as an athlete and accomplishing your dreams and goals! We will always be thankful for Erik for making us believe we can and then ensuring we did!!! Because of Erik we are a proud Ironman Family!! !” -Susie L.
“Kathy helped me to organize my training and set realistic goals, taking into consideration family and work priorities. Kathy understands that these things often take precedence and would help me adapt and stay on track during weeks that I didn’t think it was possible. I have built a strong core foundation under Kathy’s guidance, and she instilled a confidence in me that I did not have before. Kathy’s energy and enthusiasm for the sport is contagious. She is an amazing athlete herself and knows how to translate that experience to help you reach your own potential. Whether you are just starting out in triathlon or are experienced and want to take it to the next level, she is completely dedicated to you and goes above and beyond to help you reach your goals. I would highly recommend Kathy to anyone!” -Jennifer P.
I cant say enough good things about Kathy and the PEAK coaching plan. Ill start by saying I was training for my first 70.3 and with a history of injuries (ACL reconstruction, slipped L4/L5 disc, and other misc ongoing aches and pains) and I only had 2 prior years of racing sprint triathlons with no structured training plans. It seemed like an unachievable goal to do a 70.3 on 6 months of training but I wanted to give it a shot. With lingering injuries, it was important to have a coach with a PT background and I felt comfortable with how the workouts were programmed and Kathy was able to fine tune the training and adjust things as she saw fit, depending on how I felt. Kathy helped me overcome a lot of confidence issues, most notably the week before the race itself- I had run a sprint the weekend before and I was nervous I had injured my hamstring and that my chances on finishing the 70.3 were slim. She had reminded me that my previous gripe with my hamstrings resolved themselves within 2-3 days that I shouldnt worry about it. It put me at ease and that was important at that part of the timeline. All that being said, I managed to finish the race after all the training came together, and I plan on being coached by Kathy next year when I start training again. Overall, I was extremely happy with how the plan went, and Id absolutely Kathy to help with your racing. -Ben M.
“Working with Coach Kathy was a truly rewarding experience. Kathy helped me to take my training to the next level. I was used to getting my normal workouts in each day. After Kathy and I worked together to plan each weeks training schedule I started to notice a difference right away. Kathy worked with me to tailor my training schedule to fit in with all of the other duties in my schedule. Kathy’s training plans were easy to follow and did not require the need to purchase any additional equipment. Following the training plans took me from just getting a workout in to feeling stronger after each workout. I’m so grateful for Kathy’s coaching, as I was able to place in my age group for my first duathlon. I look forward to working with Coach Kathy in the future.” -Debbie D.